A Juniper Titmouse (Baeolophus ridgwayi) is gray. However, I still haven’t acquired gray and white color pencils so I use brown, yellow and pinky-beige instead. I’ve never seen a titmouse, of any species. It seems they mostly live in the US except for little sections of eastern Canada. 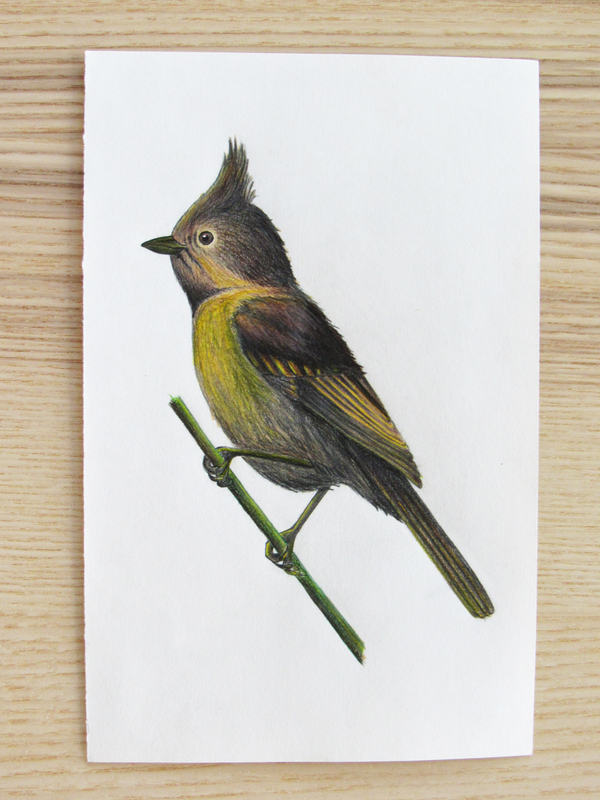 Their tiny size and funky, little head crests are delightfully cute so I drew one from the National Geographic Birds of North America Field Guide. I did imagine seeing one once in someone’s Calgary backyard. I thought I glimpsed a wee light-gray bird with a cute little crest through some bush branches… Mystery bird. Laura at Create Art Everyday is the creative spark behind this monthly feathered-drawing event. She sketched some living, moving titmice in her backyard this month. Very cool! You can see her titmice here, as well as links to October’s Draw a Bird Day bird-art. The official Draw a Bird Day is on April 8th – M. R. Emberson wrote an interesting blog post about it on A-wing and A-way. Baeolophus means ‘little crest’. Ridgwayi comes from the ornithologist Robert Ridgway. Etymology is fun sometimes. This is so adorable! One of my (many) favorite birds. I remember seeing these when I visited my grandmother in the States. You did a beautiful job with the colored pencils, this is lovely and seems ready to take flight. Thanks Haunani :-)! How lovely that you have seen these! It looks straight out of a book. Great drawing! Fantastic! I love the coloring of your drawing! I live in the states, and we do have titmouses in my area. They are beautiful little creatures. However, they are very skittish and difficult to photograph. I am hoping to get a shot or two this winter when they are easier to spot. Thank you :-)! I do hope you get to photograph a titmouse soon. Looking forward to seeing the photos! I love the way you’ve blended the colors. That is wonderful. Thanks Kirk :-)! It was fun. Wow! I LOVE this!! So well done, and such a wonderful expression. Really nice work! As a linguistics major and a writer, I agree that etymology is fun! 🙂 Your titmouse is adorable! We’ve seen those on our trips to the southwest. We have the very gregarious Tufted Titmice where we are. They always make me smile. But my favorite is the Bridled Titmouse because of its unusual markings. Thanks Teresa :-)! Yay etymology!!! It is neat to hear that you have seen a few species of titmice. I just watched Tufted and Bridled Titmice on Youtube. Cute! Wow, you did an amazing job with both the textures and colors! Very well done! Thanks Laura :-)! You’re so sweet. I’ve been enjoying the book you recommended “The Bluebird Effect – Uncommon Bonds with Common Birds”. Julie Zickefoose has so many interesting bird stories. And her illustrations are beautiful. Thanks Ian :-)! The yellow and brown titmouse may exist in another universe where some sentient creatures ooh and ahh at its cuteness. Next Next post: Bombycilla garrulus!